Buying clothes that fit is hard enough, but trying to get the right fit when shopping on-line can take the skills of a psychic. Often this involves a trip to a local store to try something else from the same brand. When it comes to sailing gear or foul weather gear the challenge is that much harder. Stores are reducing stock selection and favoring home-brand gear to reputable branded products. Wouldn’t it be great to have a way to compare sizes across brands? The team at Whitecaps Marine Outfitters have done exactly this and put together a comprehensive size chart that brings all of the best brands together. Suppose you have some Gill gear but like the styling of Henri Lloyd or features that SLAM offers. Simple. Look at the table to see what the equivalent Gill size, lets say large, is for Henri Lloyd (medium or large) or Slam (XXlarge). You’ll see that the sizes are not an exact substitute between brands. This is due to the styling and designers of each brand. It does however let you easily pick the right gear for the type of sailing you do and the amount of layering you may have. Select your size from the chart and pick the best fitting brand. Too easy. Junior sailing gear sizing is also made easy. Now you can clearly see what the cross-over sizes are and when an adult size may be appropriate. Women have a challenging time finding good off-shore gear as there is a limited selection made to fit a women’s frame. It is now easier to get a size of unisex gear that is going to provide a comfortable fit. While not the same as a bespoke suit, Whitecaps Marine Outfitter are finding new ways to get you into the right sailing gear and boating apparel. Choosing the Best Sailing Gloves – Materials. Choosing the best gloves for sailing can be a confusing process. A wide choice of brands and a lot of conflicting opinions add to the complexity. Bottom line is that there is no “best sailing glove” that meets everyone’s needs. The best gloves should match your hand and what you want to do with them. Whitecaps Marine Outfitters have put together some information to assist you in understanding some different things to consider in looking for a glove. In this document, we consider the core materials used. The Whitecaps team has taken a selection of the mainstream glove brands to consider how each approach the problem through the materials used in construction and the coverage of grip areas. Most sailing gloves are made from materials including nylon, polyurethane, neoprene and many other synthetic material including proprietary names like Amara, Black Magic™, Dura-Grip™, Proton-Ultra™ and others. Amara synthetic leather is used by most brands for the high-grip areas. Amara wears well, performs when wet, dries quickly and can handle the harsh, high UV marine environment. Brands using Amara include Henri Lloyd, Ronstan, Slam and Gill. Harken’s range of gloves uses a different synthetic leather called Black Magic™ along with other materials. Gill uses Amara, Dura-grip™ and Proton-Ultra™ to varying degrees in their range of gloves. Glove construction often has a double-layered material coverage on the main wear areas that can cover small patches on the fingers and palm or the whole area. Some gloves like the Slam Vela sailing glove add additional padding on the palm-heel, which is great for tiller-work, combined with a full-palm Amara coverage, like Ronstan’s Sticky Finger gloves, makes them also well suited to a sustained grip on lines such as in skiff sailing. Some Henri Lloyd and Gill gloves enhance the Amara leather grip by including a Kevlar stitching and thread in the material to aid abrasion resistance and tearing. The Henri Lloyd Stealth Pro gloves have a generous coverage over the palms and fingers and are cut with a longer finger length in the ¾ length gloves. The Gill Championship sailing gloves uses Amara with Dura-Grip™ enhancing the grip areas while the Gill Pro sailing glove uses Proton-Ultra™ and Dura-Grip™ to enhance grip and abrasion resistance. 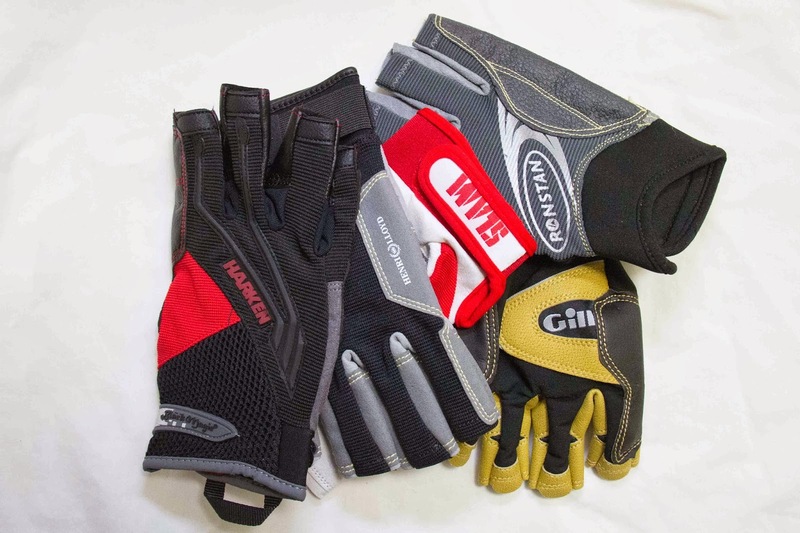 Harken sailing gloves, similar to the Gill’s Pro glove, uses a different synthetic material to Amara leather. The Harken Black Magic™, like Gill’s Proton Ultra™ is trademarked combination of synthetics including nylon and polyurethane. The Harken Black Magic™ material is grip-biased synthetic leather, a variation of which is found in some non-latex surgical gloves. The Gill Proton Ultra also has medical roots, a form being used in artificial joints due to the high wear resistance characteristics. Some sailors, especially enthusiastic “regatta” sailors, use gardening-style gloves. These are cheap, “disposable”, poor fitting and offer limited abrasion resistance. They are not made for sustained heavy line work and absorb and hold water. Think of it like skiing in your jeans – sure you can do it, just don’t fall over. For most sailors who don’t have thin lines free-running through their grip, selecting a pair of gloves made for your type of sailing is the best solution. Each glove has strengths and weaknesses and there is no “one best” glove for every job. It depends greatly on what you do and how you use them. Dinghy, one-design, beer-can racing, coastal cruising or ocean bound, gloves are an important piece of protective gear.